1. 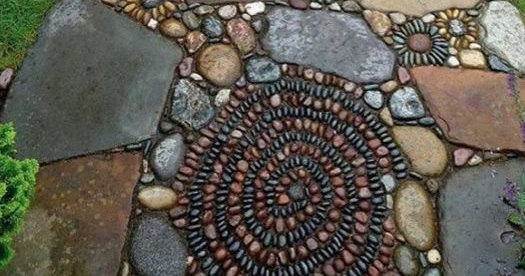 Create the pattern by sorting the stones into like sizes and then laying out the mosaic pattern in some sand. 2. Lay the base for the stones: Dig out an area 6-8 inches down. 3. Tamp 6 inches of paver base and 1 inch of stone dust onto the base. 4. Pour concrete mix onto the base and screed it to a 2-inch layer. Dampen the mix. 5. Mark the mosaic's shape in the concrete. 6. Start laying the mosaic with the center stone. Lay the adjoining stones alongside the first. 7. Fill in the pattern, working from the center outward. 8. Finish the field and saturate teh base. 9. Grout the stones by spreading topping mix to cover two-thirds of the stones' height. 10. Saturate the mix and shape the grout lines with a stiff-bristled brush. 11. Allow the mosaic to cure under a plastic tarp. Mist it occasionally over the next few days as it cures.